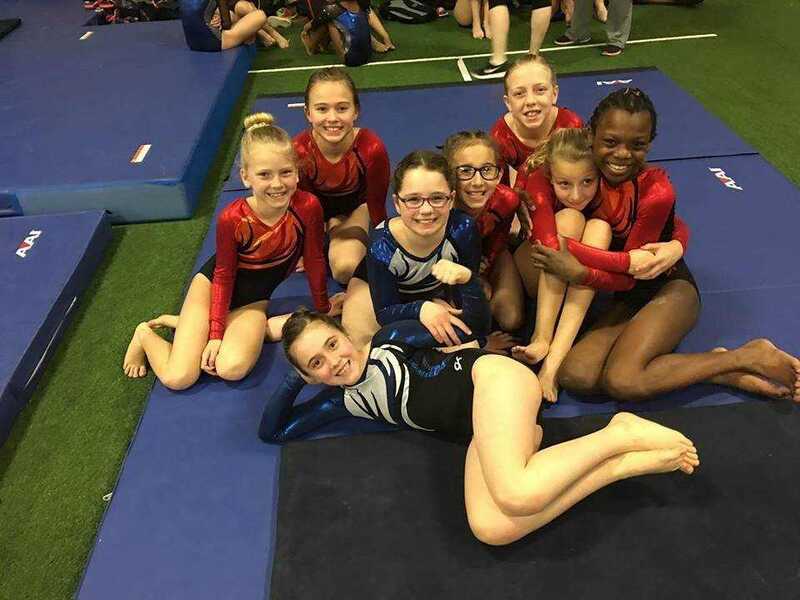 The Turnaround GK Blaze and GK Storm competitive gymnastics team continued their 2017 competition season by blazing into Des Moines, Iowa for the Field of Dreams Invite February 3-5. 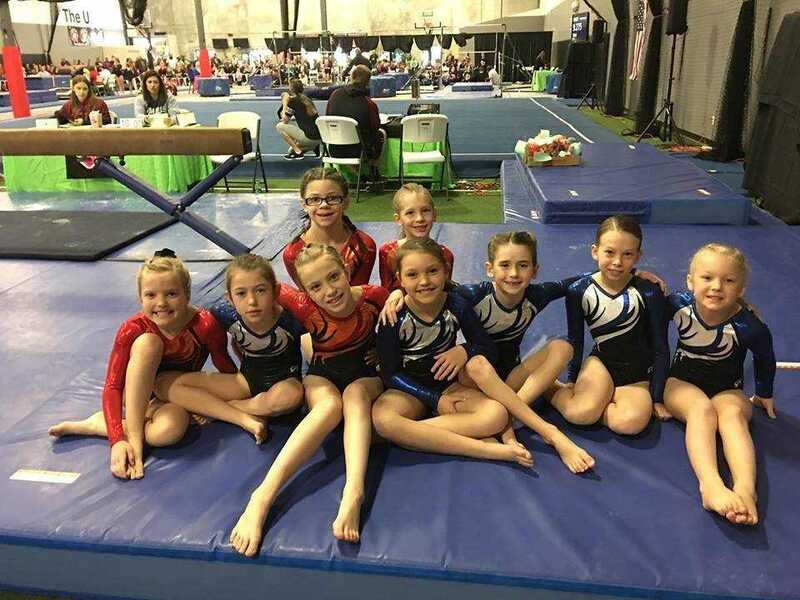 The Turnaround GK Team took 27 gymnasts that competed at four different levels, Bronze, Silver, Gold, and Platinum. BRONZE TEAM: Josilynn Pritchard - Vault 9.200, Beam 9.125, Bars 9.450, Floor 9.050, All-Around 36.825 (2nd Place). Kloie Wade-Lockwood - Vault 9.375, Beam 8.400, Bars 9.125, Floor 9.550, All-Around 36.450 (3rd place). Allison Kruse - Vault 9.000, Beam 8.950, Bars 9.300, Floor 8.150, All-Around 35.400. Ava McCarthy - Vault 8.100, Beam 9.125, Bars 8.575, Floor 9.300, All-Around 35.100. Kailey Sanow - Vault 7.950, Beam 8.975, Bars 9.075, Floor 8.550, All-Around 34.550. Madison Goings - Vault 7.150, Beam 8.250, Bars 9.475, Floor 9.000, All-Around 33.875. Hazel Simmelink - Vault 7.750, Beam 8.650, Bars 8.775, Floor 8.700, All-Around 33.875. Kenzie Niehus - Vault 7.700, Beam 8.650, Bars 9.000, Floor 8.500, All-Around 33.850. Caitlyn DeYoung - Vault 7.200, Beam 9.000, Bars 8.400, Floor 8.450, All-Around 33.050. PLATINUM TEAM: Cassidy Pravacek - Vault 9.400, Beam 8.825, Bars 9.150, Floor 9.350, All-Around 36.725 (3rd place). Kennedy Hinrich -Vault 9.375, Beam 8.000, Bars 7.950, Floor 9.250, All-Around 34.575. Ashley Reis - Vault 9.150, Beam 8.450, Bars 8.200, Floor 8.450, All-Around 34.250. Venus Gonzalez - Vault 9.000, Beam 7.750, Bars 7.650, Floor 8.575, All-Around 32.975. 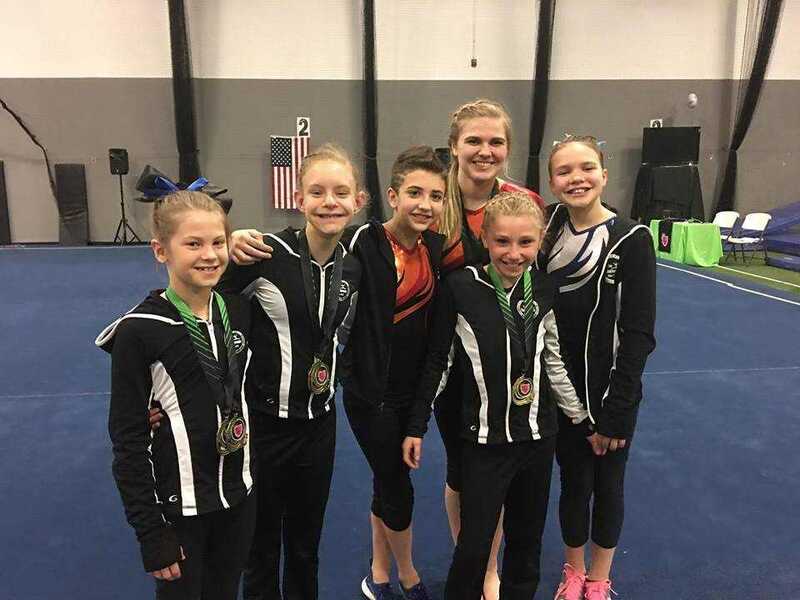 SILVER TEAM: Emma Deruyter - Vault 8.65, Beam 9.050, Bars 9.000, Floor 9.000, All-Around 35.7. Eden Kodoem - Vault 8.18, Beam 8.500, Bars 8.700, Floor 8.650, All-Around 34.025. Makenzie Derocher -- Vault 8.98, Beam 9.375, Bars 9.375, Floor 9.100, All-Around 36.825 (5th place). Peyton Small - Vault 8.25, Beam 9.050, Bars 8.350, Floor 8.525, All-Around 34.175. Isabelle Landgraf -- Vault 8.25, Beam 8.575, Bars 8.150, Floor 8.525, All-Around 33.5. Neely Bacon - Vault 7.65, Beam 8.750, Bars 8.550, Floor 8.500, All-Around 33.45. Brookelyn Britt - Vault 7.95, Beam 8.300, Bars 8.400, Floor 8.550, All-Around 33.2. Ashley Johnson - Vault 8.78, Beam 9.175, Bars 8.925, Floor 8.900, All-Around 35.775. GOLD TEAM: Abigail Bodholdt -- Vault 8.65, Beam 8.800, Bars 8.200, Floor 8.850, All-Around 34.5. Irelyn Ahlers - Vault 9.13, Beam 8.650, Bars 8.850, Floor 9.200, All-Around 35.825. Taylor Robertson - Vault 8.75, Beam 8.475, Bars 8.550, Floor 8.475, All-Around 34.25. Savannah Manley - Vault 8.98, Beam 8.950, Bars 9.225, Floor 9.050, All-Around 36.2. Alexis Barber - Vault 8.88, Beam 8.775, Bars 9.250, Floor 9.000, All-Around 35.9. Jenna Laughton - Vault 9.18, Beam 8.325, Bars 8.700, Floor 8.700, All-Around 34.9.